Ukraine's Foreign Ministry spares no efforts to keep the occupation of Crimea on the agenda. Jamala's victory in the Eurovision song contest has become an element of the big time policy and come in as an element of support for Ukraine, says a special envoy of Ukraine's Foreign Ministry on Crimean issues. 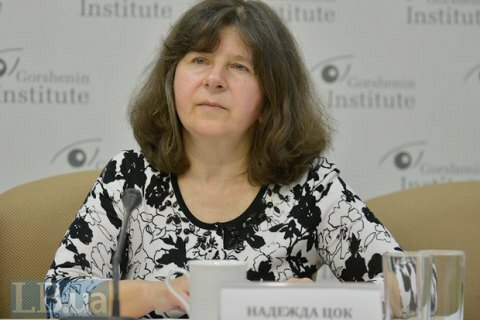 Speaking at a roundtable at Gorshenin Institute, Nadiya Tsok said the Crimean issue had been on top of the Foreign Ministry's agenda over the past two years. Whenever the opportunity arises, including in the UN, the Council of Europe, Ukraine is raising this issue, she said, and this strategy will prevail until Crimea returns to Ukraine. The diplomat said the Foreign Ministry had suggested that Ukraine and its partners - the United States, the European Union - as the signatories of the Budapest Memorandum should work out a format of negotiations, which would discuss both practical issues and strategic aspects related to the occupation of Crimea. "Today, consultations are underway as regards the mechanism of such negotiations and how other participants would see such talks. So far, the progress is slow, it goes much harder than the talks on Donbas," the diplomat admitted.